The Col du Galibier is one of the most famous passes in the French Alps. Due to its strategic position it was, until 2016, taken up 56 times in the course of the Tour de France. This makes this pass the clear leader in the Alps. Another reason for the fame of the Galibier is its elevation. With 2652 meters it ranks as the number six of the passes in the Alps. 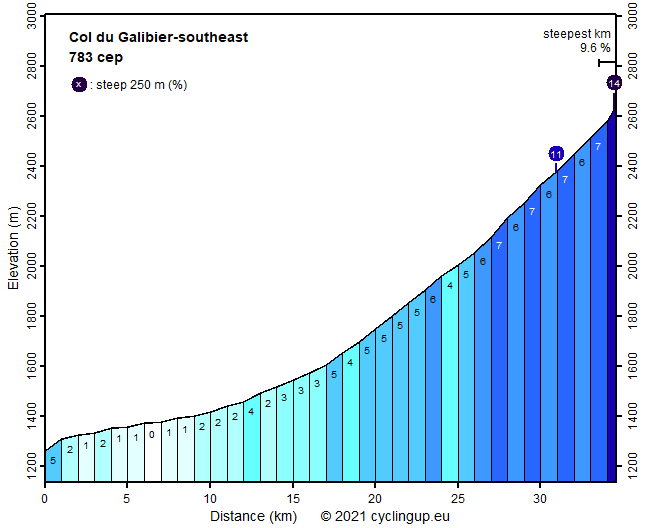 The ascent to the Galibier from Briançon is long (35 km) and both the easiest and the least attractive of the three options. It consists of two parts, of which the second part, the eight kilometers from the Col du Lautaret to the Galibier, is beautiful and of which the first part from Briançon to the Col du Lautaret is necessary. The latter runs along a main road with lots of traffic. During the first thirteen kilometers to Monetier-les-Bains the road hardly slopes (a maximum of 4%, except for the first few hundred meters), leads again and again through villages and is unpleasantly busy. After Monetier the ride becomes somewhat more pleasant due to the mountains on both sides of the valley and due to the slope of the road, which measures 5% on almost all of the final ten kilometers to the Lautaret. It is monotonous. After the Lautaret comes the most beautiful section, which is slightly steeper (6-7%) though still with little variation. Only the last kilometer from the entrance of the tunnel up to the pass is really steep (about 11%). After the Lautaret the mountains are rocky and, seen from the ascending cyclist, not really special. However, on the way back this section is of sublime beauty due to the view of the snow- and ice-covered peaks of the Écrins massif.